A two month intense service design project in partnership with the Climate Impact Research Center in Abisko Sweden. They approached us to create a system to help their researchers conduct science outreach towards the numerous tourists who visit Abisko. Our final system worked as a standalone service which allowed the researchers more freedom to conduct research, while simultaneously providing the tourists with a new way to experience the environment. The final system worked both within the city itself and maintained a presence online and in take home souvenirs in order to extend the outreach even further. 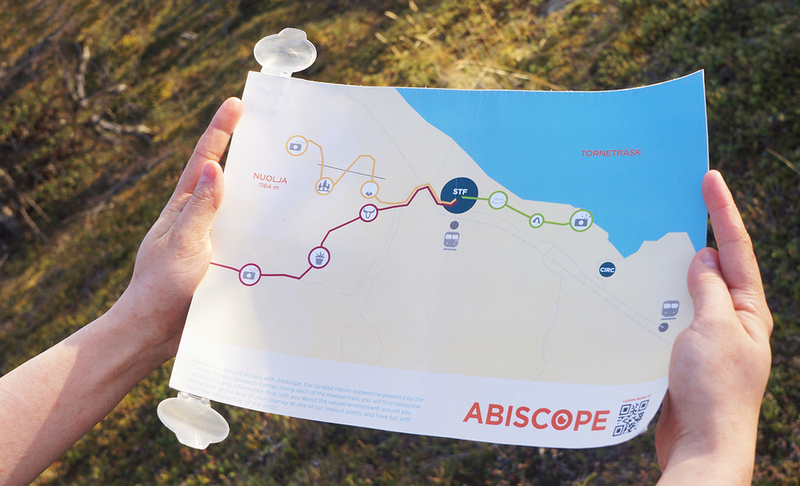 Abiscope is a learning journey which guides tourists through the natural landscapes in Abisko. The service provides a new perspective on the environment using a series of outdoor interactive stations, a unique map/telescope, framed vistas and visual captions. This system capitalizes on the natural surroundings in the area as a teaching tool, allowing them to see the environment the same way the researchers do. During our initial research we met with all the stakeholders and did in depth ethnographic research with tourists. We then clustered this information and created details customer journey maps in order to highlight the pitfalls of the current tourist experience. The out door nature experience is the key component of the journey using the landscape to highlight what the scientists find important. The pop up theater box is a simple folded paper construction that serves as a personal memento of the user’s time in Abisko. It holds additional purpose as a means of spreading the Abscope service beyond the edges of the city. The Theater Box works with your mobile phone to create a miniature theater in your hand. It contains a clear plastic sheet which reflects the light from your mobile phone screen. Simply go to the Abiscope website, choose a video and place your phone on top of the box. The result? A unique, informative, full motion keepsake for pennies. We had our final critique after the last slide the client rushed to the table to look and play with our prototypes. We held up the book and theater box and demonstrated how each worked. In a final feed back session the main stakeholder said "If it was your goal in this project to make the stakeholder happy, you've succeeded, it shows with how far it has come. This is something that we can actually use and build!"